My nine-year journey unearthing the rapidly changing landscape of Cambodia. Chris Kelly is the director of A Cambodian Spring. Today the skyline of Phnom Penh is littered with unfinished buildings, they stand as grim concrete reminders of the destructive nature of Cambodia’s progress. I first went there in 2006 as a backpacker. Many of the roads in the capital Phnom Penh were still dusty red dirt tracks. The gasoline sellers that littered the wide boulevards slept in the trees for fear of being robbed. Ravaged looking trash pickers crept by in the dark, their boney limbs spearing rubbish from the ground into their patched canvas sacks. The pavements were cracked and littered with gaping black holes from which the roar of some dark rushing tumult could be heard. I stayed in a floating guesthouse built along the edge of the Boeung Kak lake. Back then the lake was a beautiful place, filled with lush morning glory farms and ramshackle floating houses networked together by precarious wooden walkways. Youngsters paddled and played on their makeshift rafts, fishing without any want to ever catch anything, or taking stoned tourists out on watery excursions at sunset. I wanted to make a film that would help make a difference. I was young and naive and believed that a film could change the world. I would later learn that films can change the world, but rarely in the ways that their makers envision. I was immediately drawn to the warmth and friendliness of the people I encountered, but I was also aware of the dark and violent past that flowed menacingly under the surface. The potential for violence was palpable, the poverty was extreme and the country felt raw and fascinating, like an open wound. I would later come face to face with that chaotic violence. Cambodia is a unique country. Everyone you meet over the age of around fifty has survived a genocide either as a victim or a perpetrator. The Khmer Rouge regime still casts a long and dark shadow over all aspect of life there, it is a post-conflict society that still needs to heal. I took photographs, talked to people and tried to learn more about the country. When I returned to Northern Ireland, I decided I would go back to Cambodia and make a documentary, and so I began to research story ideas. When I came across the story of land grabs, it was immediately apparent that this was one of the most problematic and pervasive issues in the country, hundreds of thousands of poor people were being forcibly evicted, the government were complicit in these evictions, and the lake that I had spent so much time at was under threat. Some 20,000 people lived around it and their eviction would mark the single largest displacement of people since Pol Pot evacuated the city in 1975. I wanted to make a film that would help make a difference. I was young and naive and believed that a film could change the world. I would later learn that films can change the world, but rarely in the ways that their makers envision. When I returned in 2009 the plan was to use the funding we had to shoot for a few months, we would fly out an award-winning cinematographer, film lots of interviews with victims, NGO staff, government officials if they would speak to us, film some of the regular protests and go back to Northern Ireland to make a social issue documentary about land grabs in Cambodia. That all changed when I met the subjects of the film. I came across venerable Sovath at a press conference, he was filming his community as they delivered a petition. He had a small camera phone (this was in the days before smartphones) and I thought it would be interesting to film another filmmaker. It was an opportunity to reflect on the role and importance of documentary film within a wider socio-political context. I later learned that Sovath was an artist, he would paint the story of Buddha on the walls of pagodas all over the country. When his family and villagers were attacked during a violent land grab, his response was to put down his paintbrushes and pick up a camera and film so that he could share information about what had happened. This was someone who seemed to intuitively understand the power of creative expression as a tool for change, and the potential power of documentary filmmaking. I would spend the next six years documenting this brave Buddhist monk as he pursued a precarious and lonely path of what he calls ‘Engaged Buddhism’ between the corrupt religious authorities and a government that bought their silence with threats and bribes. The monks were once the moral compass of the country; they were revered by the people and actively engaged in matters of society. That changed when the Great Supreme Patriarch Tep Vong was co-opted by Prime Minister Hun Sen. Now the monks are told to stay inside their pagodas and not get involved in life outside, as power and influence flow into the Sangha, like a reversed Mandala. When I realised that this was a story that was unfolding right in front of me, it felt like a disservice to try and make another one-dimensional, talking-heads style social issue documentary, with all the familiar clichés and oversimplifications you find when outsiders fly in and try to paint the complexity of life with broad and simple strokes. Here there seemed to be so much more to explore and unearth. What started as a somewhat misguided attempt to help, quickly became something else – an exploration of our universal human truths. The film became an unapologetically subjective portrait of the people and landscapes I encountered in Cambodia, and so it became a film ‘about’ activism, rather than an activist film. I would explore the complexities and ambiguities of fighting for what you believe in. I was an outsider and I was acutely aware of that fact, and so it made sense to try to tell a story that anyone from anywhere in the world could relate to. The film became an unapologetically subjective portrait of the people and landscapes I encountered in Cambodia, and so it became a film ‘about’ activism, rather than an activist film. Not long after spending time with the Venerable Sovath, I came across the women from Boeung Kak lake. These were fierce, committed, intelligent women who were determined to fight for their homes. When I first met them the lake had just begun to be filled with sand dredged from the conflux of the Mekong and Tonle Sap rivers. Their homes were still intact, but no one knew what was going to happen. The landscape around them was being physically destroyed, as sand and water was pumped into their homes 24 hours a day. A deluge of brute force was drowning the residents in sand and sweeping them out of the city and off the land that was so valuable. It was a cruel and fitting metaphor for Cambodia’s entire approach to development. Cambodia’s progress is inexorably intertwined with the complex and murky goals of the development organisations and bi-lateral donors that shape so much of the country’s economic landscape. For decades, western donors, and the taxpayers who fund them, have poured money into development projects, without ever questioning the political will or capacity of the government to implement them. Unaccountable institutions like the World Bank, who do not answer to any people, are lending money to corrupt governments like Cambodia’s ruling party. In the case of Boeung Kak and the World Bank-funded Land Management program, they were found to have actually created the conditions necessary for the forced eviction to go ahead by failing to follow their own guidelines. They are actively creating poverty, not alleviating it. What was inspiring about the women of Beoung Kak was their willingness to take on an institution like the World Bank, and actually manage to hold them to account for the failed program they ran in Cambodia. Over the six years I spent filming them, many came and went but there were two clear leaders of the group; Tol Srey Pov and Tep Vanny. Vanny was singled out to be the spokesperson for the group, perhaps because she could speak English and the others could not. She would travel abroad, win awards, and meet foreign politicians and dignitaries like then Secretary of State Hillary Clinton. She even spoke at the World Bank headquarters in Washington, and asked why they continued to loan money to Cambodia when their case was still not resolved. Now the landscape of Cambodia is changing rapidly; this surge in development is transforming the lives of millions of people. But the transformation is creating a vast divide between the rich and poor. 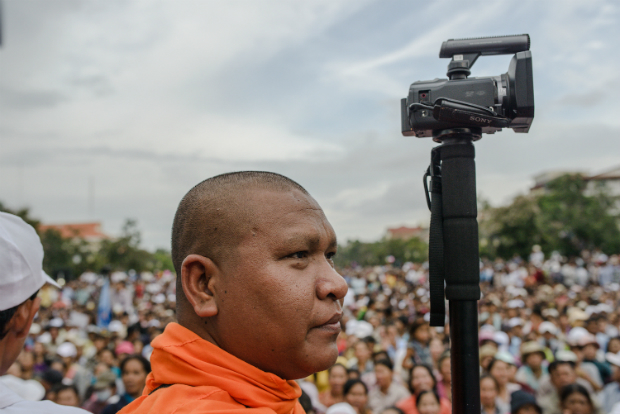 That growing divide, along with the immense popularity of the protesters I was filming laid the foundations for the outcry in 2013 that almost overthrew the authoritarian rule of Prime Minister Hun Sen. Activists like Venerable Sovath were using social media like Facebook and YouTube to circumnavigate the censorship of the state run media and provide an alternative narrative to that offered by the ruling party. In 2013 the hope for change, and the belief that it might actually happen was very real. There were hundreds of thousands of people on the streets marching and calling for Hun Sen to step down, the atmosphere was elated and people really felt that change was possible. Hun Sen’s ruling party has dominated Cambodian politics since the late 90’s, and this was the first time in decades that he had been genuinely threatened by the opposition. Many observers attest that the ruling party lost the 2013 elections, and only held onto power through election fraud. There are elections again in July this year, and the situation in Cambodia now seems much worse than at any time I was there before. The opposition party have been dismantled and their seats in government given out to supporters of the CPP. All of the Khmer language independent media outlets in the country have been shut down, and their journalists are either in jail or have been co-opted into state-owned media. The English language Cambodia Daily was recently shut down by the government, and the other English language paper, the Phnom Penh Post was just sold to a Malaysian company whose clients include Hun Sen. This marks the end of free press in Cambodia. Human rights defenders, activist monks and opposition party leaders are either dead, in jail or have fled to safety abroad. International NGO’s are being kicked out, and local NGO’s are finding it increasingly difficult to operate within the law as new laws aimed at silencing them are passed regularly. The Cambodian people have little hope of the elections being free or fair, and so many will not turn out to vote. Yet the ruling party still seek credibility in the eyes of its western donors, and wish to maintain the preferential trade deals and tariffs the countries export industries enjoy with the EU. These two facts are the main leverage that the west holds over the ruling party. If democracy is to have a chance in Cambodia, there needs to be a credible opposition, and the elections need to be free and fair. A Cambodian Spring is in cinemas now.